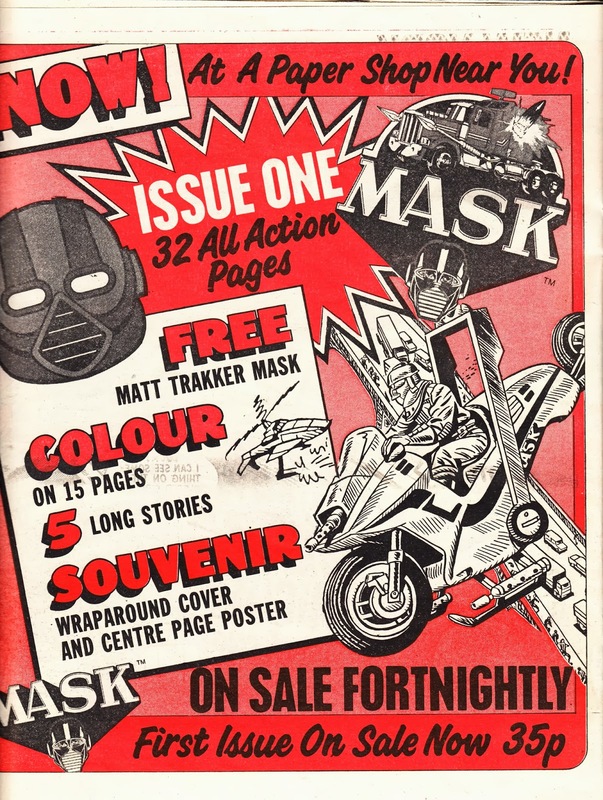 MASK (Mobile Armoured Strike - ahem - Kommand) was one of the most successful entries into the eighties era of toy/ animation/ comics/ licensing synergy. In no small part because it liberally borrowed from two already established lines from Hasbro... and many of the same marketing tricks. The G.I. JOE range was going great guns... so Kenner established their own high-tech counter-terrorism outfit. And THE TRANSFORMERS (and, to a lesser extent, all the knock-offs) showed that kids were hooked on the idea of vehicles with a secret. So Kenner shamelessly designed a range of (almost*) JOE scaled figures and gave them vehicles with hidden weapons. And - seemingly just to justify the name and placate the lawyers - each character, hero and villain, was given an easy-to-lose mask which (as established in the TV and comics lore) had a unique fighting feature. MASK's battle with VENOM (Vicious Evil Network Of Mayhem. Really), as shown in the spin-off media, basically consisted of a succession of ill thought through villainous schemes perpetrated by the normal assorted of non-threatening lug-head villains. Their criminal mastermind was - for some reason - a tubby old guy, Miles Mayhem. Kenner borrowed every trick they could find from the Hasbro toy book. They teamed-up with DIC to produce a better-than-average animated series which crossed the Atlantic as part of TV-am's toy-plugging weekend schedules. The stateside comic book tie-in came courtesy of DC Comics who tested the waters with a four issue limited series (ala THE TRANSFORMERS) in 1985-86 followed by a regular series which clocked-up another nine issues. Considerably more successful was the British comic from IPC/ Fleetway. Rather than reprint the US strips (some of which appeared instead in the British MASK annuals), this contained all-new material from British creators. The stories tended to be more juvenile than the US strips or most of Marvel's toy tie-in offerings. However, the formula must have worked as the comic ran for a more-than-creditable 80 issues (fortnightly for the first year, then weekly for the remainder of the run) with a further run of strips within the pages of (of course) the EAGLE. Management really pushed the boat out to make MASK a success. A special glossy Preview Edition was bagged with IPC's other weeklies just before launch and the four-page insert, below, appeared in the EAGLE cover-dated 1 November 1986. The regular comic also boasted better printing, better paper and more colour than IPC's tired looking existing titles. Tharg and Max must have looked on in despair. Of course, such decadence didn't come cheap and the new launch was priced at 35p, a whole nine pence more than the other weeklies (although issues only appeared fortnightly). 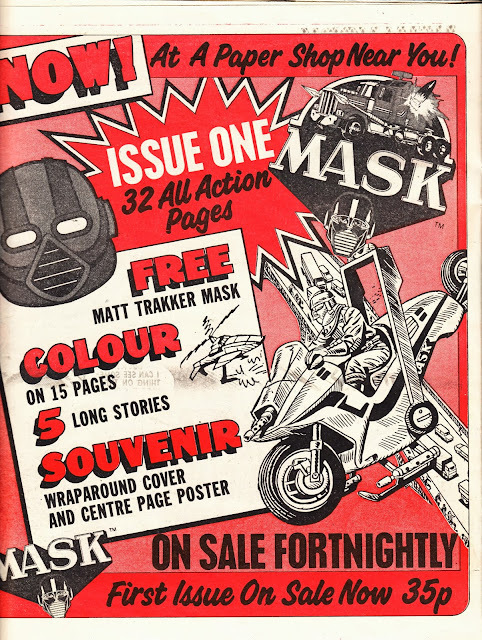 The early issues borrowed a tried-and-tested IPC toy plugging idea by including free cardboard masks. Presumably it didn't take the ace freebie planners at King's Reach Tower long to concoct that particular tie-in. 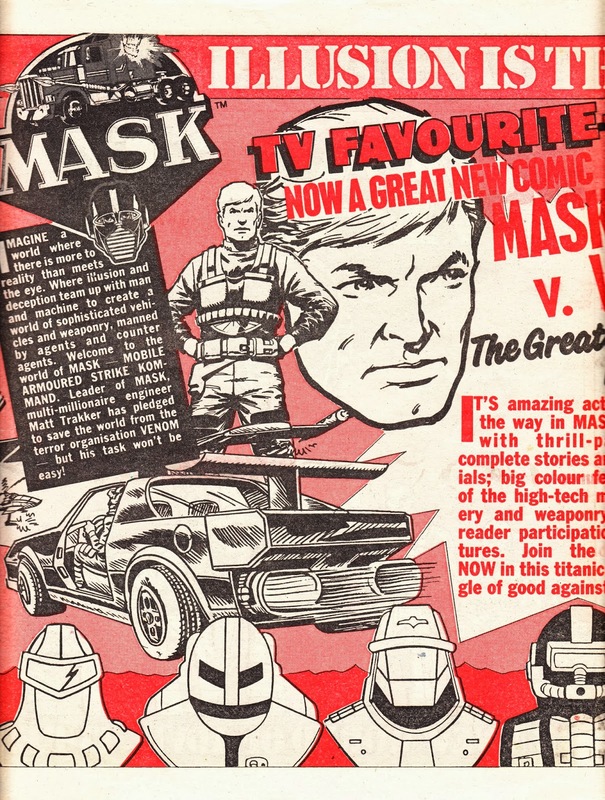 The US MASK books were included in the bundle of US DC titles shipped to British newsagents. MASK managed to dodge the whole early nineties cartoons-are-cool-again revival which means done of the comics material has ever been reprinted. The TV show was, however, released on DVD and is worth another look. *As KK points out in the comments, they were actually a bit smaller. 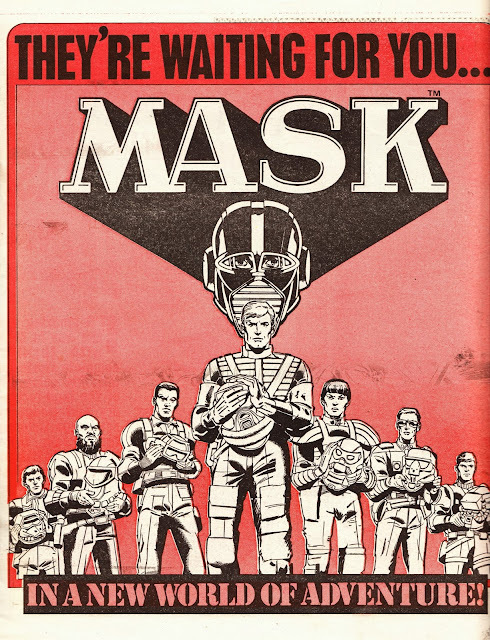 A correction to your otherwise excellent entry - the MASK figures were significantly smaller than GI Joes, which were 3 and 3/4 inches at this point (once upon a time they had been 12 inches, the same dolls we knew in the UK as Action Man). If memory serves, MASK figures were closer to 3 inches - maybe even a little smaller - making them appear like dwarfs next to Joes and Star Wars figures. One has to admire calling the bad guys Venom... which is nothing at all like GI Joe's Cobra. 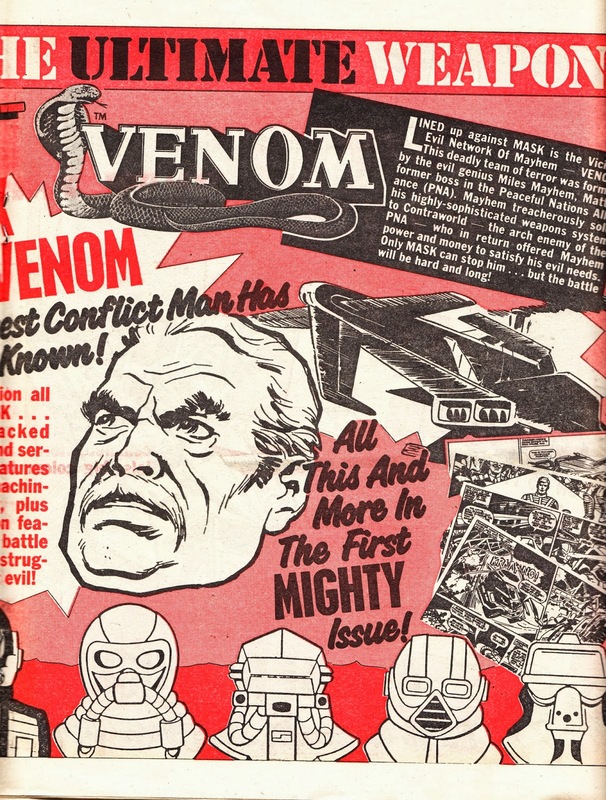 One can just imagine when the designers came up with that one - "Let's call the bad guy organisation 'Venom'. Right then, early lunch everyone!" Oh gosh yes, you are right! I do remember seeing the figures and they were on the small side and had less sculpting and detail, which made them look cheap... and their masks even smaller! I was too old for the toys when they came out but I did - for a while - follow the comics and the TV show. I'm really surprised Hasbro didn't sue! Thanks for the prompt correction! Thanks Ed. One of the reasons I started STARLOGGED was to help ME make sense of the myriad of half-remembered stuff from this era. As I've gone along I've stumbled across a lot of things I didn't even know existed (or suspected didn't actually exist) so it's as much fun for me as it is you! Thanks for keeping coming back!